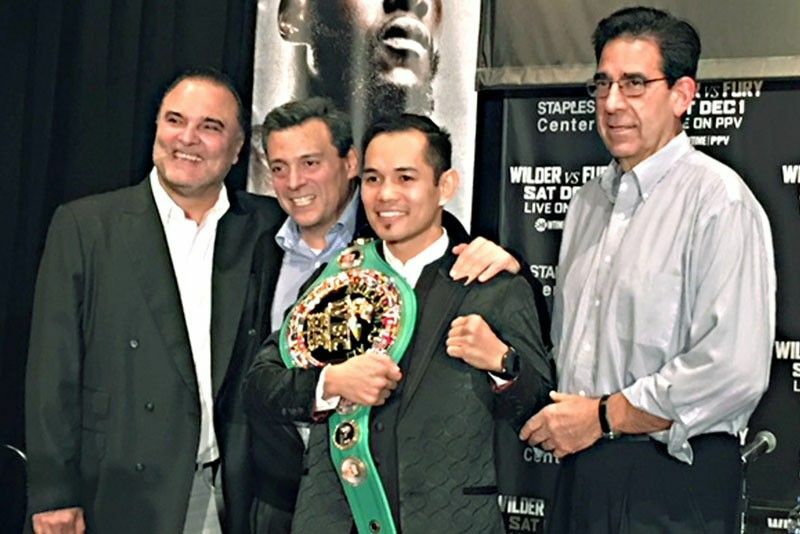 WBA bantamweight champion Nonito Donaire displays his WBC diamond belt with (from left) Ringstar Sports CEO Richard Schaefer, WBC president Mauricio Sulaiman and International Boxing Hall of Fame executive director Edward Brophy. LOS ANGELES – WBA/WBC diamond bantamweight champion Nonito Donaire, Jr. stood face-to-face with Mark Anthony Barriga last Friday and gave him pointers on how to beat Mexico’s Carlos Licona in their 12-round battle for the vacant IBF minimumweight title at the Staples Center here this morning (Manila time). They met up shortly after Barriga and Licona stepped on the scales for the weigh-in on a makeshift stage at the open-air walkway of the Los Angeles Convention Center last Friday afternoon. Donaire flew in from Las Vegas, where he lives, to receive the WBC diamond belt from WBC president Mauricio Sulaiman in turnover rites at the California ballroom of the Westin Bonaventure Hotel earlier that morning. Barriga appeared star-struck and looked Donaire straight in the eyes as he soaked in sage advice from the five-division world champion who recently went down two weight classes to claim the WBA/WBC diamond bantamweight crowns. Barriga, 25, was only seven years old when Donaire, 36, turned pro in 2001. Donaire’s vast experience is reflected in his record of 39-5, with 25 KOs, compared to Barriga’s 9-0, with 1 KO. Donaire said he expects the fight to go the distance since neither Barriga nor Licona packs one-punch knockout power. “They’re fighting in the 105-pound division,” said Donaire. “They’re not heavyweights but who knows? Their records don’t indicate power. Still, if you land a big shot, anything can happen.” Licona has scored only two KOs in a 13-0 record. At the turnover rites, Donaire promised “more to come” in pushing his career forward. He said beating Ryan Burnett for the WBA and WBC diamond belts in Scotland recently felt like winning his first championship. Schaefer said it was unprecedented that Donaire scaled down two weight classes to win the 118-pound title. He disclosed that when negotiating for the title bout against Burnett in the World Boxing Super Series, Donaire insisted the WBC belt would also be at stake. Sulaiman said he’s honored to award the belt to Donaire, citing his loyalty to the WBC. Donaire previously held the WBC diamond superbantamweight belt. Schaefer called Donaire a future Hall of Famer in the presence of International Boxing Hall of Fame executive director Ed Brophy. For his part, Donaire told Sulaiman he is proud to be a WBC champion and said he will always uphold the values of integrity and loyalty in keeping with the WBC’s principles.